My dad died August 10th and, as some of you have already experienced, when death closes one chapter it opens another chapter full of paperwork, sorting, and redefining normal. The paperwork is done (on our end of things), the sorting hasn’t started (procrastination), and the redefinition of normal is in progress, probably perpetual progress. It’s time to get back to quilting. My hip bursitis is better but not totally healed. Walking can be painful still, but I can now sit in regular office chairs at my computer and sewing machine for long enough periods of time to feel like I’m accomplishing something. Our summer has been hot and dry, too hot to work indoors most of the day, so I set up an old sewing machine on a long, 8-foot table outdoors under the trees. My plan was to get some UFOs quilted so I could do the bindings this winter. Lots of room on an 8-foot table, right? Not if you have two dogs who like to sprawl out on the table so they can better survey the neighborhood. One of the blessings of living on a hill, I guess. I finished one little quilt then gave up because Dusty and Trudy were barking too much. I’ll try again this week -- the neighbor kids will be back in school so maybe the dogs won’t have such interesting things to bark about. While fussing about in my studio this summer, I found two heart-themed fabrics, one light and one dark, both measuring less than a yard in length. I’ve been watching and waiting all summer for ideas to use up those two fabrics. I’ve been making wall hangings to go with each month or season of the year, and these two seemed destined for a Valentine’s Day quilt. Last week, I finally found a block pattern that set my creative juices flowing. It’s a traditional, 2-color block called Sunrise, Sunset. To get myself back into the quilty swing of things, I’ve decided to make a 9 or 12 block wall quilt that I’m calling "He Loves Me, He Loves Me Not." If you have two contrasting fabrics you’d like to use up, sew along with me! Any two contrasting colors work well with this block. 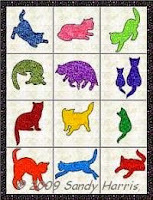 The virtual quilt below shows just a few possibilities. Drats! I've been trying for two hours to upload images but my internet connection is just too slow. I'll shrink my images and try again tomorrow.